It’s the final week of the regular season and 11 games involving 17 District 9 teams on the docket. 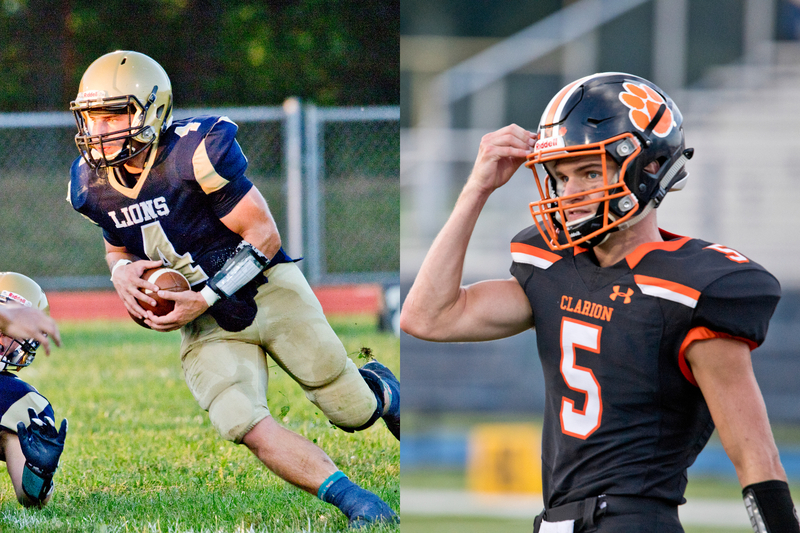 C-L’s Ayden Wiles (left) and Clarion’s Archer Mills lead their teams into Friday night’s game at Clarion University. With playoff posturing and positioning, some carry more weight than others. And throw in a little history as well and you have Clarion-Limestone’s trip to Clarion University to take on Clarion. It’s the 48th meeting on the field, and probably the last one as the two schools are headed to a co-operative agreement that could lead to other sports joining forces as well. This fall, the junior high programs combined on the Clarion sideline. The Bobcats have already co-opped with North Clarion in football. At 7-2, Clarion-Limestone has nailed down the No. 2 seed in the Class 1A playoffs while 6-3 Clarion is battling positioning in the Class 2A bracket. At the moment, the Bobcats are in the No. 4 position. Check below for playoff scenarios. The Lions have lost 14 straight games to the Bobcats and most of them have been blowouts, all but three of them Mercy Rule drubbings — the worst coming in a stretch from 2012-14 where it was 57-0, 74-0 and 67-0 — but the last two meetings have been much closer, including the Bobcats holding off the Lions 25-20 last year. The series is actually 31-17 in favor of Clarion with a forfeit win among the decisions. And this time around, teams appear to be going in different directions. After starting the year 6-0, the Bobcats have lost three straight including last week’s 48-19 rout at home to Brockway. They haven’t lost four straight since 1993. C-L, meanwhile, has won four of five games. Lions do-it-all junior Austin Newcomb nearly broke the district rushing record with his 416-yard effort in last week’s win over Curwensville, but he did break the Lions’ single-season yardage record previously held by Mike Macefe (1,701 in 2016) and he stands at 1,798 yards on just 170 carries with 22 TDs. 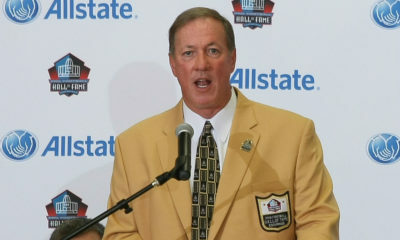 He’s also the team’s leading receiver (22-471, 4 TDs). Ayden Wiles (917-125, 14 TDs) is also closing in on a 1,000-yard season on the ground while quarterback Colby Himes (45-for-99, 945 yards, 10 TDs, 6 Ints.) is nearly 1,000 in the air. Clarion has struggled with some injuries. At least two of the Bobcats’ top players — Logan Minich and Nick Porciello — have missed time recently. Minich still leads the team in rushing (79-419, 4 TDs) while Porciello is the team’s second-leading tackler on defense and one of its top offensive linemen. Last week, Cutter Boggess ran for 33 yards on 11 carries while two quarterbacks, senior Archer Mills and sophomore Calvin German saw action. Mills has thrown for 1,096 yards with 14 touchdowns and six interceptions, but may line up at receiver with German taking the snaps. Boggess (74-293, 2 TDs) and Sam Minich (41-308, 4 TDs) will likely get carries. Minich is also the team’s top receiver with 40 catches for 656 yards and 11 TDs. In other games, unbeaten Clearfield (9-0) hosts Bishop Carroll (2-7) in its Mountain League finale in what’s actually the lone conference game on the schedule. Brockway (7-2) visits Curwensville (6-3) in one of the games with high playoff implications when it comes to positioning. Elsewhere, it’s Brookville (6-3) visiting DuBois (3-6), Redbank Valley (6-3) hosts Punxsutawney (2-7), Keystone (3-6) visits Moniteau (5-4) and Union/A-C Valley (4-5) traveling to play Ridgway (8-1) in Johnsonburg. Four other games have D9 teams playing out of the district — St. Marys (0-9) at Warren (5-4), Karns City (3-6) at Titusville (2-7), Otto-Eldred (4-5) at Cowanesque Valley (0-9) and Oil City (8-1) at Bradford (6-3). A reminder that teams can opt-out of a playoff berth if it qualifies. That could hold especially true in Class 1A and 2A. Smethport and C-L are locked in at the No. 1 and 2 seeds. Coudersport is definitely the No. 6 seed with Union/A-C Valley and Otto-Eldred finishing with the No. 7 and 8 seeds in some order. With the Terrors facing winless Cowanesque Valley and Union/ACV visiting Ridgway as the heavy underdogs, it’ll likely be Otto-Eldred at No. 7 and Union/ACV at No. 8, assuming the Terrors achieve their own .500 rule by beating winless Cowanesque Valley. The Falcon Knights have opted in to the postseason regardless of what they do against Ridgway. 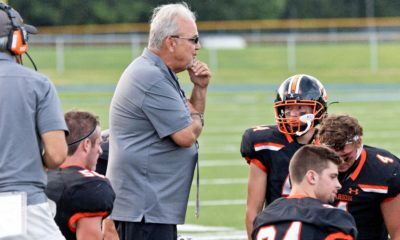 If it winds up a seven-team bracket, Smethport will have three weeks of practice between games. The Lions will likely play Otto-Eldred at home in the quarterfinals. —Since Elk County Catholic has finished its schedule, it’ll stay at 7-2 with 940 power rating points and will land in whatever spot is determined by the results of the Redbank Valley and Curwensville games. — If the Bulldogs and Tide both win, it’ll be Curwensville, Redbank Valley and Elk County Catholic at 3-4-5 with ECC visiting the Bulldogs again in the quarterfinals and No. 6 Coudersport visiting Curwensville. — If the Bulldogs and Tide both lose, it’ll be ECC, Curwensville and Redbank Valley at 3-4-5 with Coudersport visiting ECC and Redbank Valley visiting Curwensville again in the quarterfinals. — If the Bulldogs win and the Tide lose, it’s Redbank Valley, ECC and Curwensville at 3-4-5 with Coudersport visiting Redbank Valley again and Curwensville traveling to ECC. — If the Bulldogs lose and Tide win, it’s Curwensville, ECC and Redbank Valley at 3-4-5 with Coudersport traveling to Curwensville and Redbank Valley heading to St. Marys to play ECC. With three of the eight teams in the division opting out of the postseason — Karns City, Keystone and Kane — five teams are headed to the playoffs and the stacking order is Ridgway, Brockway, Brookville, Clarion and Moniteau. That would mean a 4/5 matchup next week with the semifinals the following week. So the top three seeds would be off next weekend. — Assuming Ridgway beats Union/A-C Valley, the Elkers are the No. 1 seed and Moniteau is the No. 5 seed. Seeds 2 through 4 could vary. A Brockway win over Curwensville and a Ridgway upset loss to Union/ACV would give the Rovers the top spot. — If Brookville beats DuBois and Brockway loses to Curwensville, then it’s Brookville No. 2 and Brockway No. 3 with a semifinal matchup in two weeks. If Brockway wins, it’s the No. 2 seed. The Rovers can’t drop below the No. 3 seed, even with a loss and Bobcats win over C-L.
— Brookville clinches the No. 3 seed at worst with a win, but a Raiders loss and a Clarion win over Clarion-Limestone drops Brookville into the No. 4 spot with Clarion to No. 3 and the Raiders facing Moniteau next week at home in a quarterfinal matchup. D9’s Punxsutawney and St. Marys have opted out of the postseason in the District 5-8-9 Sub-Regional setup. Right now, it’s Westinghouse (4-5), Bedford (4-5), Somerset (3-6) and Perry (3-6) in the top four positions. It may be just a three-team setup considering only three will finish with a winning record, led by unbeaten Clearfield, D6’s Bellefonte (7-2) and Bradford (6-3). DuBois is in the No. 4 spot and has clinched that spot, which would mean a rematch against Clearfield, but the Beavers must beat Brookville before they accept the berth. The Bison try to close out a perfect Mountain League season along with their eighth undefeated regular season, the others being 2013, 2012, 2010, 2004, 1998, 1994 and 1955 along with an unbeaten 10-0-1 regular season. Clearfield, which may not have a first-round Sub-Regional playoff game next week if DuBois doesn’t enter the postseason, has cruised through a schedule that’s seen it outscore foes by an average of 45-13. Its only close game was a 56-42 win over Penns Valley for its second win. The Bison average 452 yards per game offensively with quarterback Isaac Rumery running the show. He’s completed 92 of 132 passes for 1,888 yards with a remarkable ratio of 21 touchdowns to just two interceptions. Rumery has also rushed for 412 yards and seven TDs. Brett Zattoni (122-738, 11 TDs) and Caleb Freeland (93-701, 15 TDs) are both over 700 yards rushing. Jake Lezzer (37-811, 8 TDs) and Taye Lynch (31-716, 10 TDs) are Rumery’s top receiving targets. The Huskies have struggled to the end of the season, losing four straight games after their lone conference win in a 31-13 decision over winless Philipsburg-Osceola. They opened with a 19-13 overtime win over East Hardy, W.V. Quarterback Jake Zazvrskey (151-606, 4 TDs) leads the BC running game along with passing for 324 yards. Jarrett Grove (89-471, 2 TDs) also gets carries out of the backfield. It’s the first-ever meeting between the schools. The Huskies are in their first year in the Mountain League. It’s an important game for both teams in the playoff standings, the Rovers in Class 2A and the Golden Tide in Class 1A. They’ve been regular season foes in recent years as Allegheny Mountain League members, but the two are in different classifications and divisions this time around. The Rovers are playing well, riding a three-game winning streak after dropping their only two losses in back-to-back weeks to Ridgway and Bradford. The Rovers racked up over 400 yards of offense in last week’s 48-19 rout of Clarion. Brockway’s Tyler Serafini (154-939, 3 TDs) is closing in on 1,000 rushing yards with Jon Wood (64-381, 4 TDs) coming off a 93-yard game against Clarion. Quarterback Peter Downer was nearly perfect last week against the Bobcats, completing 10 of 12 passes for 202 yards and three TDs. 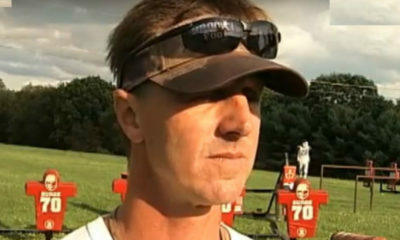 For the year, he’s thrown for 1,466 yards and 17 TDs with five interceptions, completing 85 of 169 passes. Wood (21-340, 5 TDs), Josh Solnosky (16-322, 6 TDs) and Garrett McClintick (13-325, 2 TDs) are his main receiving targets. The Tide’s four-game winning streak was stopped by C-L in a 46-14 rout last week. Blake Passarelli (144-683, 6 TDs), Cole Bressler (81-481, 7 TDs) and Avery Francisco (55-309, 4 TDs) lead the Tide’s running game. Quarterback Noah VonGunden (42-for-101, 611 yards, 6 TDs, 3 Ints.) threw for a career-high 217 yards last week against the Lions. Jake McCracken (17-219, 3 TDs) is his top receiver. The Tide edged the Rovers, 15-13, last year. The Raiders and Beavers square off for the first time since 2013. While the Beavers may or may not enter the postseason with no chance at a winning record, the Raiders might need to win to avoid playing a quarterfinal game next week in the Class 2A playoffs. Raiders quarterback Robert Keth, in just 5 1/2 games, has thrown for 1,731 yards and 20 touchdowns against seven interceptions. With Cabe Park (49-1,160 , 16 TDs) already over 1,000 yards receiving for the season, Bryan Dworek is close (56-927, 10 TDs) in just six games. Holding Ridgway to just one touchdown last week in a 28-11 win over the previously unbeaten Elkers, the Raiders face a DuBois squad that’s dropped four of five games since starting the year 2-2. 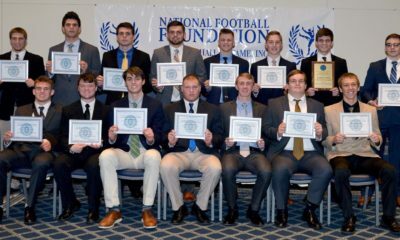 Last week, senior Eric Schneider returned to run the offense at quarterback and threw for 142 yards and a touchdown while running for 115 yards on 24 carries. Junior Alex Kovalyak had been the starting QB the previous six games, throwing for 1,024 yards and eight TDs with eight interceptions. Schneider (35-for-64, 343 yards, 1 TD, 3 Ints.) also leads the team in rushing (106-501, 2 TDs) with Dylan McCluskey (72-312, 6 TDs) also getting carries. Junior tight end Chase Husted (39-594, 3 TDs) is the team’s leading receiver. The Owls host the Oilers, who already know who their District 10 Class 5A playoff foe is next week when they play Meadville. The Oilers feature running back Christian Cole, who’s on the verge of the D10 single-season rushing mark. With a whopping 2,662 yards to go along with 37 TDs, he’s a 272 yards away from tying the record owned by Lakeview’s Blake Reddick in 2013. Naturally, the Oilers average 459 yards per game on the ground. Bradford has won four straight, featuring a similar run-heavy offense led by Donny Pattison (1,353 yards, 17 TDs). The Bulldogs try to make it three wins in a row and bolster their positioning in the Class 1A playoffs standings against a Chucks squad going into its final game on a five-game losing streak. Running backs Hunter Wiles (68-429, 2 TDs) and Travis Crawford (72-281, 4 TDs) are the Bulldogs’ leading rushers while quarterback Keaton Kahle (98-for-168, 1,258 yards, 14 TDs, 6 Ints.) is coming off a four-TD passing game last week against Union/ACV. Ethan Hetrick (29-374, 5 TDs), Hunter Buzard (27-383, 3 TDs) and Hunter Martz (38-368, 3 TDs) are Kahle’s top targets. Chucks senior quarterback Dylan Ishman (79-for-171, 952 yards, 12 TDs, 6 Ints.) is now over 3,200 career yards. Running back Alex Gianvito has rushed for 412 yards and two touchdowns. Ishman’s top receivers are Carter Newcome (34-416, 4 TDs), Gianvito (18-243, 4 TDs) and Max London (19-251, 4 TDs). The Warriors look to tune up for the Class 2A playoffs at home against their former KSAC rival Panthers. They’ve won two straight and they’ll be playing a quarterfinal 4/5 seed matchup next week against either Brookville or Clarion. Cody Wise (136-1,023, 6 TDs) went over 1,000 yards rushing last week. Quarterback Chance Nagy (33-for-82, 430 yards, 2 TDs, 8 Ints.) is the team’s second-leading rusher with 612 yards and seven TDs. The Panthers have lost three straight, scoring just 14 points in losses to Union/ACV, Smethport and Elk County Catholic. Quarterback Isaak Jones has thrown for 1,289 yards with 11 TDs and 11 interceptions. Brandan Kapp (22-380, 2 TDs) and Jayden Blazosky (22-331, 3 TDs) are his top receiving targets. The Elkers try to bounce back from their first loss of the year and do need a win to assure themselves a No. 1 seed in the Class 2A playoffs. It’ll be the third game for the Elkers without standout linebacker/running back Evan Furlong. The Elkers feature a run-oriented offense along with a short passing game with quarterback Paul Gresco (93-for-139, 1,076 yards, 11 TDs, 5 Ints.). Three running backs, not including the injured Furlong, are over 300 yards with Gabe Watts (62-412, 6 TDs), Jake Wickett (69-384, 7 TDs) and Cole Secco (44-330, 2 TDs). Daunte Allegretto (12-308, 3 TDs) is the team’s leading receiver in yardage and has seven interceptions on defense. The Falcon Knights had their three-game winning streak snapped last week in their 33-7 loss to Redbank Valley. Nolan Cumberland (82-457, 5 TDs) leads the Union/ACV running game. Quarterback Luke Bowser (41-for-114, 663 yards, 7 TDs, 9 Ints.) and receivers Tanner Merwin (13-246, 3 TDs) and Caden Rainey (10-216, 1 TD) lead the passing game. Needing a win to secure a .500 record and meet its own standard for accepting a playoff berth, the Terrors travel to Westfield to face the winless Indians from District 4. The programs have been traditional late-season foes, but haven’t met since 2015 when the Terrors won, 41-13. The Indians have lost 14 straight games dating back to last year and have yielded 38.8 points per game this year. Quarterback Seth Huyler (70-for-167, 987 yards, 4 TDs, 17 Ints.) is closing in on 1,000 yards passing. The Terrors ended their four-game losing streak with a 47-8 win over Sheffield last week. Quarterback Cole Sebastian (141-for-230, 1,711 yards, 20 TDs, 12 Ints.) still leads the team in rushing with 279 yards and three TDs. His top receivers are Chris Connelly (27-506, 3 TDs) and his brother Chase Sebastian (30-425, 7 TDs). The Gremlins aren’t going to the playoffs for the first time since 2010 and just the second time since 1997. They’ll close out the season with District 10’s Rockets on the road. The Gremlins’ Hunter Jones is closing in on 1,000 yards rushing for the season at 940. The Rockets started 2-1, but have lost six straight since. Last week, they lost to Girard, 33-0. Parker Harvey has 882 yards rushing with 10 TDs prior to the game. The Flying Dutchmen try to avoid a second straight winless season and stop a 21-game losing streak against Warren, which did not qualify for the District 10 playoffs. Quarterback Jake Kupchella (114-for-194, 2,018 yards, 15 TDs, 2 Ints.) leads the Dragons. Running backs Devin McGrath (73-309, 2 TDs) and Cody Ritter (66-292, 1 TD) lead the Dutch offense with quarterback Todd Taylor (61-for-126, 6 TDs, 7 Ints. ).